I wish I could have posted earlier today, I hate posting this late but I've been so busy today! Today I have the first instalment of my Dollish Polish order. I did have something else lined up for today but after getting my nail mail yesterday I couldn't resist! 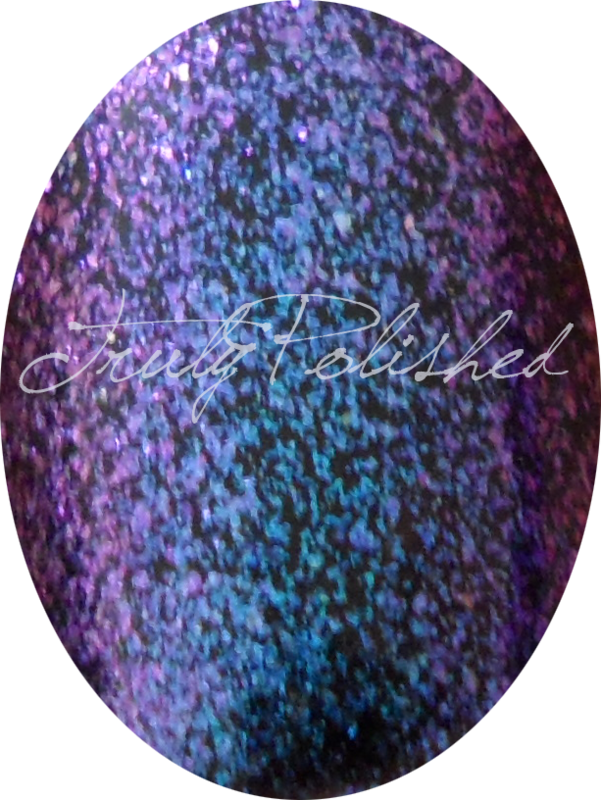 This polish is called Aurora Borealis after the Northern Lights, and is a glass fleck topcoat with a blue to purple duochrome. I had to layer this over black, as I do with all of my topcoats, but I can't wait to try this out over other colours. I'm so glad this polish is here because I was starting to get a bit sick of the red/gold/green colour shift that we're seeing everywhere, this colour shift is such a welcome change! 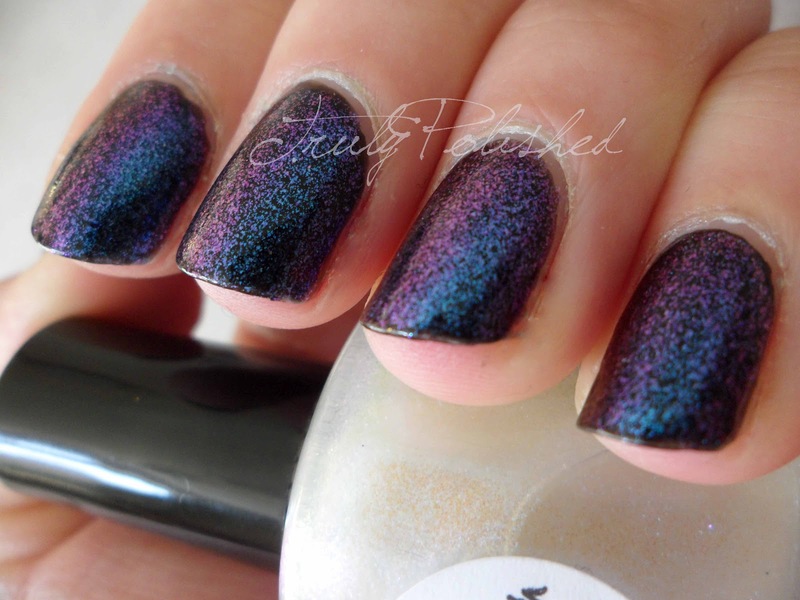 I used two coats of the black polish by Gold by Giles I reviewed here and then one coat of Aurora Borealis. The formula was absolutely amazing! I finished it all off with a coat of Seche Vite and it looked so beautiful! I even got complemented on my nails at the post office! The lady made me write down the name and where I got it from so she could try and get it for herself! Find the rest of the photos after the jump, I got slightly snap happy with this one! Who can blame me?! This leans really blue in the sunlight, so gorgeous! I HAD to do a macro of this! If you love this polish as much as I do, which you must... You can get it for $8 here on Etsy when the Dollish Polish store re-opens! This is definitely one that's worth the wait. My biggest regret is not buying more from this brand! I'll be sure to place a big order when I can! i love your blog hun. i was sent here by island girl insights. you can get your blog recognized by joining a blog hop its really easy and you discover other blogs as well. http://bloglovetherapy.blogspot.com/p/about.html. Glad you're enjoying my blog! I'll definitely check yours out and the blog hop!